Home > Uncategorized	> He Rides Again!!!! Frank A Cavaluzzi is preparing for the ride of a lifetime, or more importantly, to ride for other people’s lifetimes. One year ago I met Frank on his ambitious ride around Lake Champlain. I trailed him down Route 9 just outside of Plattsburgh, NY until he reached the Visitor’s Center where he stopped for a break … and to talk to the media. He spoke about his issues with asthma and how his specialized bicycle was helping him overcome his debilitating allergy. He told us how he was riding in an effort to Stand Up to Cancer , about his mother’s struggle with the disease and about the difficulty of his trip. After all that, what struck me most was not that he’d been standing on his bike for more than 400 miles but rather his determination and willingness to do for others. In the weeks and months that followed, Frank and I continued to keep up with one another. I finally revealed my personal story of my father’s battle with Mesothelioma and the life-altering changes that have come with it. I told him of the race my father was planning that would help raise money and awareness for the Mesothelioma Applied Research Foundation. Frank immediately became a supporter. Now let’s be honest, there are givers and ignorers. There are a lot of people who see or hear the call to help and a lot of folks who choose not to acknowledge it. Frank is not one of them. He hears the need and runs, or rather rides, straight for it. For this I am grateful. Not only was he an incredible supporter of my father’s 1st challenge as Race Director of the South Florida Miles For Meso event, but now Frank is at it again. Frank will be riding from McKeesport, PA to Washington DC in what he’s calling The 2010 Standing Cyclist Pitt to DC Meso Challenge. Total mileage … 318 STANDING, no coasting, no sitting, miles. 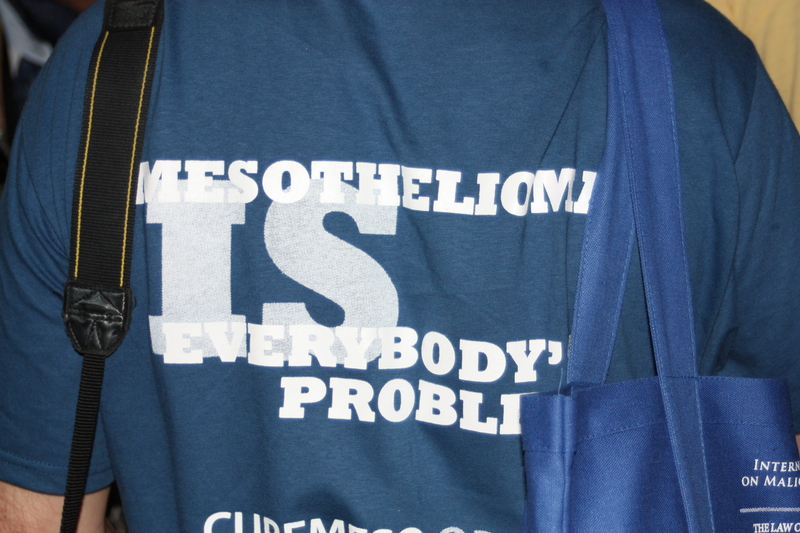 And all to bring awareness to this crazy disease caused by asbestos called Mesothelioma. He is set to leave on Wednesday August 25th at 9:00 AM from the Great Allegheny Passage trailhead, just 10 miles south of Pittsburgh, PA.
Pittsburgh is a highly industrial city with all types of jobs exposing hundreds of thousands of people to asbestos throughout the last 60 years. Many of the occupations involving trades such as steel work, heating and cooling repair, automotive repair and steamfitting. It seems a perfect location to begin as it is also an area where my father lived while attending Duquesne University during the height of asbestos mining and use. Frank’s journey will continue along the Great Allegheny Passage which boasts a number of historical sites including civil war battlefields and George Washington’s path through the Appalachian Mountains, now an abandoned railway. Once through this scenic tour of history, Frank will travel into Cumberland, Maryland where he will meet with the Chesapeake & Ohio Canal. The C & O Canal, otherwise known as the “Grand Old Ditch”, was in operation from the mid 1800’s until about 1924. Now it is a commonly biked and hiked path known as the C & O towpath trail. It connects Cumberland to DC and runs about 185 miles. 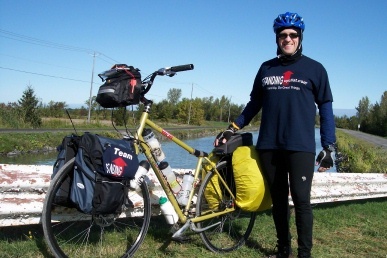 Frank is planning to ride about 60 miles a day, carrying all his gear along the way. He should complete his trip on the morning of Tuesday August 31st. I plan to meet Frank on the south side of Thompson’s Boat House at the mouth of Rock Creek. I hope to be accompanied by my father and members of the Mesothelioma Applied Research Foundation which is in the process of relocating to DC as I write. I encourage everyone along Frank’s path to come out in support of his ride. Please join us at the end of his journey in DC for a small welcome and congratulatory greeting. Stay posted on his tour by going to his SPOT page. From here he will have regular updates. And support him for his incredible sense of giving, compassion and accomplishment by going to his website and sending words of encouragement, donating to MARF, joining him on Facebook and meeting him along this trail of inspiration. Thank you Frank and thank you to all my readers. And He’s Off H R 771 … We’ve Got The Signatures!